YouTube has added a few tweaks to its video watching that can be accessed on the site's longer videos. The Lights Off application means that you no longer you have to sit and watch a clip in standard view with all the bumph of the site annoying you. Switch on the app and it will switch the lights off, darkening all info except for the viewing screen – simple but effective. Another new feature is Theatre View. This one is a little more gimmicky. Actually, it's extremely gimmicky. Switch to Theatre View and you will be able to watch your chosen clip within a pair of cinema curtains. This is completely pointless, but it does look pretty smart. 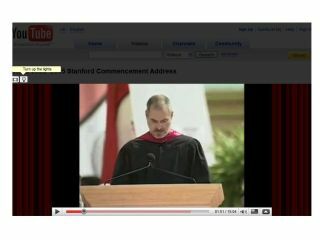 You can see the new features, which are slowly being rolled out across the whole site, on a video of Steve Jobs giving a speech at Stanford University. These additions will no doubt be welcomed by sectors of the YouTube community that look to the site for bigger content, rather than two-to-three minute music videos.